There can be problems with hiring staff suffering with learning disabilities. 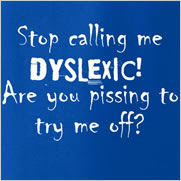 My boss wants a diverse staff that is representative of the general population, and with dyslexia affecting between 5 and 17% of people and since it does not effect intelligence, he hired a dyslexic as his personal assistant. Come to find out there are some advantages that he couldn't have imagined when he brought this fine young lady on board. Today he discovered one of them when he sent her a memo to sack his cook. Needless to say she got a big raise. AND ... today I got fired. My boss let me go for creating a photo-shop image of his 16 year old daughter sucking my 14" tool, and emailing it to everyone in the department. A few of my former co-workers thought it funny, the majority were disgusted, but I am just confused! What the hell is photo-shop? Gee, why would your boss want to fire you because his teenage daughter was suckin' your meat pole? I would think that would bring you two guys closer together. Look at all you have in common. He has a 16 year old kid and "Daddy's lil' girl blew his employee. Sweet post, dude.